Below is a comprehensive English Civil War timeline, featuring the events leading up to the war, the most important battles, and the events signaling the end of the war. 13th June 1625 King Charles Marries King Charles I married Henrietta Maria, daughter of Henry IV of France at St Augustine’s Church, Canterbury, Kent. The marriage was not popular because she was a Catholic. May 1626 Parliament Dismissed Parliament were unhappy with the activities of Charles’ chief minister, George Villiers, 1st Duke of Buckingham. Buckingham had led a failed mission to Cadiz and it appeared that he was planning to help the French to put down the Protestant Huguenot uprising. Parliament moved to have Buckingham dismissed from office. Charles retaliated by dismissing parliament. 13th March Parliament Recalled Charles needed money to finance the war with France and Spain and reluctantly recalled Parliament. 1628 Thirty-Nine Articles Charles re-issued the Thirty Nine Articles into the Church of England. This was seen as a move towards Rome and evidence of the King’s Catholic leanings. 7th June 1628 Petition of Right Parliament formed a committee of grievances and prepared a Petition of Right which was presented to the King. The Petition was designed to protect subjects from any further taxation unauthorised by Parliament. Charles signed the document reluctantly. 22nd August 1628 Buckingham Assassinated George Villiers, 1st Duke of Buckingham, was stabbed to death by naval lieutenant John Felton. 3. That any merchant who paid ‘illegal’ taxes betrayed the liberty of England. 1632 Thomas Wentworth Known as ‘Black Tom Tyrant’ by the Irish, Thomas Wentworth, Lord Deputy of Ireland, ruled Ireland with a firm hand. However, his rule alienated the planters of Ulster and antagonised the landowners of Connaught. August 1633 Archbishop Laud Charles appointed William Laud as Archbishop of Canterbury. Laud was known to have Catholic leanings and Charles hoped that his appointment would help to stop the rise of the Puritans. 18 June 1633 King of Scotland Charles was crowned King of Scotland at Holyrood Abbey, Edinburgh. 1634 – 1636 Ship Money This tax was paid by coastal towns to pay for the upkeep of the Royal Navy. In a bid to raise more money, Charles now imposed the tax on inland towns as well. June 1638 Ship Money John Hampden, challenged the King’s right to impose such a tax but he lost the case and the court ruled that the King was the only authority that could impose such a tax. February 1638 National Covenant and Book of Common Prayer Charles demanded that the Book of Common Prayer be used in the Scottish Kirk. The Calvinist-dominated Scottish church resisted the move. There were riots and a National Covenant was formed which protested against any religious interference in Scotland by England. The Scottish Kirk was so incensed that it expelled the Bishops installed in Scotland by James I. 1639 Pacification of Berwick Thomas Wentworth’s had led a scratch army against the Scots but had been defeated on the border and had been forced to sign a temporary truce at Berwick. Wentworth told the King that in order to raise an efficient army he must recall Parliament. Charles, who had enjoyed his eleven years tyranny, was forced to recall Parliament. 13th April 1640 Short Parliament The new Parliament refused to authorise any new taxes until the King agreed to abandon ‘ship money’. The King said that he would only abandon ship money if Parliament would grant him enough money to re-open the war with Scotland. Parliament refused and was dismissed after three weeks. 1640 Oliver Cromwell Oliver Cromwell was elected to Parliament for the second time. He openly criticised Charles taxes and the level of corruption in the Church of England. Oct 1640 Scotland Thomas Wentworth, Earl of Strafford, set out for the Scottish border with a makeshift army. However, the army mutinied and the Scots seized English land. The Scots demanded a daily rate be paid until a satisfactory treaty was put in place. 21 Oct 1640 Treaty of Ripon This treaty between Scotland and England allowed the Scots to stay in Durham and Northumberland until a final settlement was concluded. Nov 1640 Long Parliament Charles had to have money to pay for an efficient army with which to defeat the Scots. However, he couldn’t have the money until he agreed to Parliament’s demands which included an Act which stated that parliament should meet once every five years and the arrest for treason of Strafford. Charles had no choice but to comply. 20 May 1641 Wentworth Beheaded Thomas Wentworth, Earl of Strafford, was executed on Tower Hill. Summer 1641 Triennial Act This act allowed Parliament to be summoned without royal command and declared ‘ship money’ to be illegal. Late Summer 1641 Revolt in Ireland A revolt broke out in Ireland. Parliament critical of the King’s handling of matters in both Ireland and Scotland, passed propositions that the Parliament and not the King should be responsible for the country’s defence. 22 Oct 1641 Catholic Rebellion in Ireland A Catholic rebellion broke out in Ulster and quickly spread across the country. Many Protestant settlers were driven from their homes and the rebellion became war. November 1641 Grand Remonstrance This document, put together by Pym, listed parliament’s grievances against the King since his reign began. 4 Jan 1642 Charles Arrests five MPs Charles instructed his attorney-general to issue a charge of treason against one peer and five members of the Commons including Pym and Hampden. When Parliament refused to recognise the charge, Charles sent a troop of horsemen to make the arrests. However, Parliament had been warned and the five men had fled. this move by Charles was extremely unpopular and across the country people declared themselves for Parliament and against Popery. Charles removed himself and his family from Whitehall to Hampton Court. Jan 1642 Preparations for War Charles sent his wife Henrietta Maria to the Continent to enlist Catholic support for his cause against Parliament. She was also to pawn the crown jewels to buy arms. Although both sides were now preparing for war, negotiations continued. March 1642 Militia Ordinance This allowed Parliament to take control of the Militia, virtually the only armed body in the country. 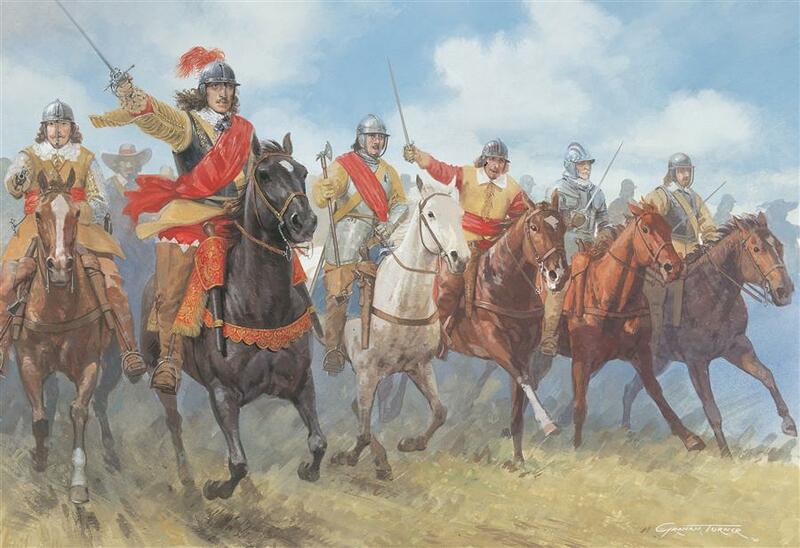 April 1642 Charles – Hull Charles tried to secure an arsenal of equipment left in Hull from his Scottish campaign. He was blocked by Sir John Hotham, with parliamentary and naval support and was forced to retire to York. Charles made his headquarters in York. June 1642 Nineteen Propositions The Nineteen Propositions were issued by Parliament in the hopes of reaching a settlement with the King. They called for a new constitution recognising their own supremacy; demanded that ministers and judges should be appointed by parliament not by the King and also that all Church and military matters should come under the control of Parliament. 22 Aug 1642 Civil War – Standard raised Charles raised his standard at Nottingham formally declaring war. However, both sides hoped that either war could be averted or that one decisive battle would put an end to the matter. 7 Sept 1642 Portsmouth falls to Parliament The vital port and fortress of Portsmouth surrendered to Parliament. 23 Oct 1642 Battle of Edgehill In the early afternoon, Charles sent his army down the hill to meet the Parliamentary army commanded by Essex. On the royalist right was Prince Rupert who broke Essex’s left flank. In the centre, reinforcements arrived and they managed to push forward putting the lives of the King’s sons, Charles and James, in danger. The battle was a stalemate with neither side able to advance. 12, 13 Nov 1642 Small Battles The Royalists led by Prince Rupert managed to surprise and capture Brentford. However, the following day Rupert was surprised to find his route to the city of London barred at Turnham Green by Essex and an army of some 24,000. The Royalist commander decided to retire rather than fight. 30 June 1643 Battle of Adwalton Moor the Royalist commander, William Cavendish decided to try and enclose the Parliamentarian army in Bradford. However, Fairfax, the Parliamentary commander decided that his army had a better chance of survival if they fought the Royalists in a battle rather than being surrounded and forced to surrender. The Royalists won the battle. 13 July 1643 Battle of Roundaway Down The Royalists were the first to charge but there was no counter-charge. After two more charges the Parliamentary cavalry had fled. Waller then turned his attention to the Parliamentary infantry who stood firm until a force led by Hopton attacked them from behind. Caught between two Royalist armies the majority of Parliamentarian soldiers simply fled from the battlefield giving the Royalists victory. Aug 1643 Solemn League and Covenant This document swore to preserve the Church of Scotland and reform the religion of England and Ireland ‘according to the word of God and the example of the best reformed churches’ and to protect ‘the rights and liberties of parliaments’. It was accepted by the English Parliament in September. 20 Sept 1643 First Battle of Newbury Essex’s force of tired wet and hungry Parliamentarians intended to rest at Newbury, a town sympathetic to the Parliamentarians. However, Rupert had arrived there first and Essex had no choice but to fight. June 1644 Battle of Marston Moor This was the largest single battle of the Civil War involving 45,000 men. Although the Royalists were outnumbered, they decided to fight. They were defeated by Parliament. For the first time since the Civil War had began Rupert’s cavalry were beaten by a Parliamentarian cavalry charge. 27 October 1644 Second Battle of Newbury The Royalists were sandwiched between two Parliamentary forces. Each time Parliament made some gain they were beaten back by the Royalists. The battle, which lasted all day, ended in a draw. 14th June 1645 Battle of Naseby The Parliamentarians broke their siege on Oxford and forced the Royalists into battle. Initially the Royalists took up a defensive stance but later the order to attack was given. The battle lasted just three hours and saw the death of most of the Royalist foot soldiers. It was a decisive victory for Parliament. Charles fled the battlefield as soon as it was apparent that he had lost both the battle and the war. November 1647 Putney Debates This was a series of debates held by different Parliamentarian forces to try to decide on a new constitution. 20th January 1649 Trial of King Charles began King Charles was tried for treason by a High Court of Justice specially set up for the trial. The court found Charles guilty and sentenced him to death. 30 Jan 1649 Execution King Charles I was executed by beheading, outside Whitehall Palace, London. He was buried in St George’s Chapel, Windsor. This English Civil War timeline is part of a larger resource featuring other articles on the war, including the main factions, battles, and other information. Click these links for more information.